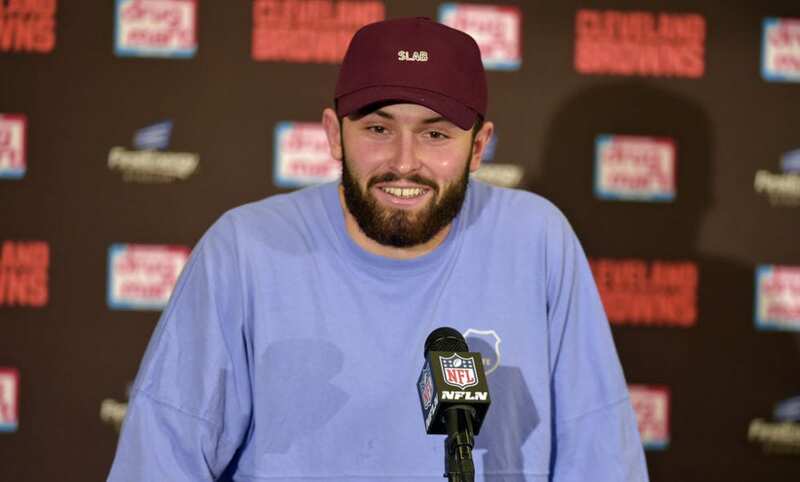 BEREA, Ohio (AP) — Baker Mayfield’s reaping rewards for his stellar rookie season. Cleveland’s cocky and charismatic quarterback was voted winner of the Joe Thomas Award — player of the year — on Wednesday by the local chapter of the Pro Football Writers of America. In addition, Mayfield, whose play has sparked the biggest one-season turnaround in club history, was selected AFC Offensive Player of the Week after throwing three touchdown passes in a win over Cincinnati. After years spent looking for their franchise QB, the Browns (7-7-1) appear to have found him in Mayfield, the No. 1 overall draft pick who is 6-6 as a starter entering the season finale at Baltimore. Mayfield has thrown 24 TD passes, two shy of the NFL rookie record shared by Peyton Manning and Russell Wilson. Browns guard Joel Bitonio was selected as the Dino Lucarelli Good Guy Award winner for his cooperation with the media for the second straight year. Be the first to comment on "Browns’ Mayfield Racking Up Awards, Leading Browns Revival"